The pantry is the heart of your home. As a space that everyone is likely to visit every day looking for snacks, it’s important to make sure it stays organized. A good pantry isn’t a room, it’s a tool. So how can you make it work for your family? For homeowners in Jacksonville, there are many options for updating and customizing your pantry. All of which will help save you time and money! There are so many reasons why pantry organization is important. Here are a few key reasons from the team at More Space Place Jacksonville. In a messy pantry, it can be easy to forget how long your food has been sitting there. More and more boxes get piled in and expiration dates become more like guidelines than actual rules. To make sure food doesn’t go to waste, consider a custom pantry that encourages organization and makes it easier to sort through what you need and don’t need. The kitchen is the focal point of the entertainment experience. If you are constantly having guests over, you already know that an organized pantry is the key to avoiding any additional stress. If you’re cooking, you want to be as efficient as possible and really make your pantry work for you. Plus, a pantry is a place guests will interact with and sometimes even wander into for a quick snack. Packing school lunches can quickly turn into a nightmare without any sense of organization. With a customized pantry, you can make space specifically for grab-n-go lunches. Streamline the process with designated snack baskets so it’s easy to pack a lunch box with the essential food groups rather than scavenging for things in the pantry at the end of a grocery cycle. Oftentimes, we reach for unhealthy foods because of accessibility. It’s easier to pull out a bag of chips than cut up an apple. However, a custom pantry designed with accessibility in mind, will make healthy food more accessible and provide a space that encourages your family to make better nutritious decisions. Even the smallest pantries can be made to be extremely efficient. How you organize your pantry can have a direct effect on your family’s lifestyle. 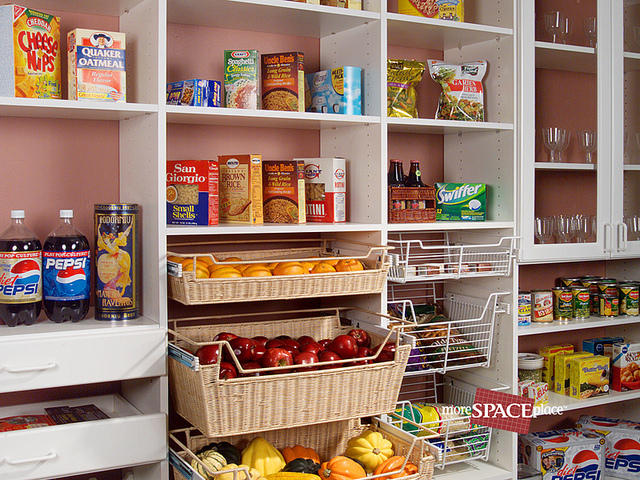 Luckily, the team at More Space Place Jacksonville is here to design the most organized pantry for your family. Give us a call today to schedule a free consultation.